Andrew "Ender" Wiggin is a Third, born only after his parents received special permission from the U.S. government to exceed the two-child limit. His entire existence has come about in hopes that he, unlike his older brother, Peter and older sister, Valentine, will qualify for Battle School and go on to fight and win in the war against an insect-like species known as the buggers. When Ender is just six years old, Colonel Graff comes to take him to the battle school along with the many other exceptional kids who make up his launch group. Immediately, Ender shows aptitude for battle far above that of his peers, and he rises rapidly through the ranks of the school, all the while battling his own inner demons, many of which manifest themselves in a fantasy game he plays during his free time. Over time, Ender makes friends and enemies, pleases and disappoints those above him, and sacrifices his childhood for the greater good. One weekend, my husband chose the 2013 film adaptation of this book for our weekly movie. Ordinarily, I would prefer to read the book first, but in this case, I think watching the film first did help me. Though there are definite problems with the movie, it did a decent job of bringing the battle school environment to life. When I read fantasy and science fiction, I frequently have trouble imagining things for which I have no frame of reference, so having these visuals as a starting point was a great help in acclimating me to this story. And what a story! 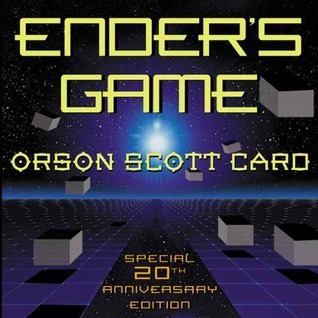 Since the author has stated that he believes Ender's Game is best appreciated in an audio medium, I listened to the audiobook and read along with the Kindle edition from my local library. Though this is not my usual genre, I could not stop listening. From the start, I was intrigued by the unusual setting, in which young children are recruited from their families to be trained how to fight in zero gravity. I also found Ender fascinating, and really liked seeing how he handled challenges at different phases of his education, even if I sometimes didn't like his choices. 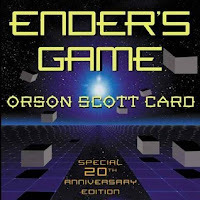 I found the opening scenes of each chapter, where higher-ups discuss Ender and their hopes for him, very effective in keeping the story grounded in time, and in building suspense about how Ender would fare as the stakes continually increased. The moral dilemmas raised by the story also give the reader a lot to think about, and they provide great fodder for discussion. I also enjoyed the somewhat prophetic nature of the subplot in which Ender's siblings take on alter egos and stir up political debates on "the nets." When I reached this section of the book, I turned to my husband and said, "Orson Scott Card predicted Internet trolls!" It's always fun when science fiction predicts something that later comes to fruition. All of my praise for the book aside, however, I have to admit that I'm shocked to know people read this with kids. First of all, the intended audience is adults. The character has to be a child because of the nature of the problems society faces in the novel, but the things this child endures are not for the faint of heart. There are a number of instances of very nasty physical violence in the book, all of which occur outside of combat, and all of which are disturbing. There are also many grotesque and frightening images in Ender's fantasy game which I would also not recommend for young kids. The author does refrain from using curse words, and there is a fair amount of toilet humor, so it does occasionally feel like a middle grade novel, but in general, I think truly appreciating Ender's story requires an adult perspective colored by a bit of life experience. There is no way I would suggest this book to a child under 10, and for my own kids, I'm thinking it will be the teen years before they are ready. There are a lot of sequels to Ender's Game, and I doubt very much I will finish the series. I am interested, however, in reading Ender's Shadow (1999), which relates the same events from the point of view of Ender's friend Bean. I'm curious to see how this setting appears from another point of view. I enjoyed this one as well and it's definitely not my genre as well. I could see this book appealing to 10 and up but below that seems surprising. I think it'd be a little too disturbing. It isn't a world I'd like to revisit but I wouldn't mind seeing more of Bean. I thought he was an interesting character and I liked the differences to Ender.